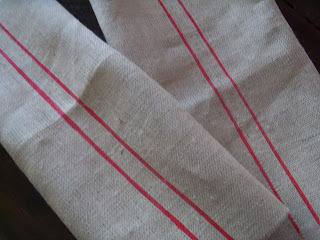 These french linen-vintage grain sack-feedsack-vintage burlap bags or whatever you call them are the coolest things and I wanted some. I wanted some pillows and I wanted some to recover a couple of chairs and possibly a couple of barstools. I like the simple ones with one or two stripes. However, they are way more expensive then I want to pay so I haven't bought any yet. I just drool over the pictures of ones I want. 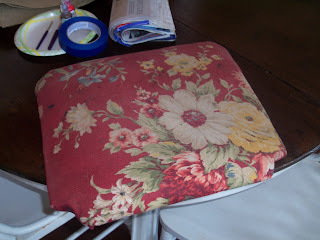 Here is the chair seat I want to recover. 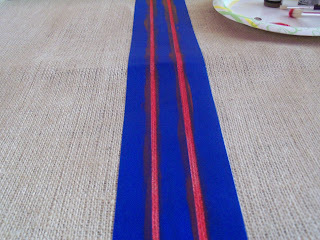 First, I did a test stripe. 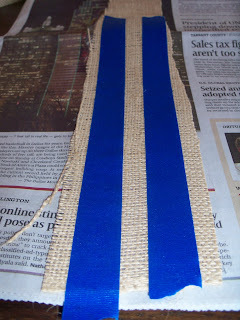 Tape off where you want your stripe to be. Paint! I dry brushed the paint on lightly and repeated until I got the coverage and color I wanted. I wasn't sure if I wanted a red stripe or a brown stripe. After testing both, I decided to do red. 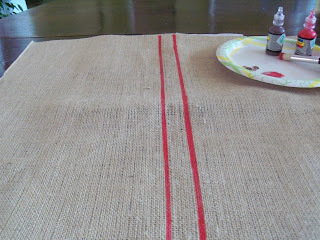 Pull the tape off and you have a stripe! 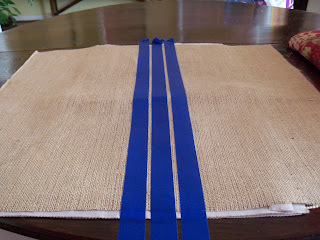 I then taped off two smaller stripes and painted those. Here's what it looked like after the tape came off. 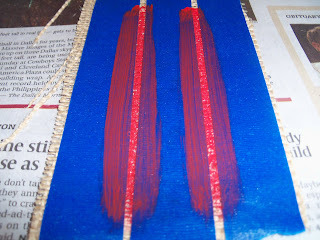 So, for the real thing, I decided I wanted two thin red stripes. 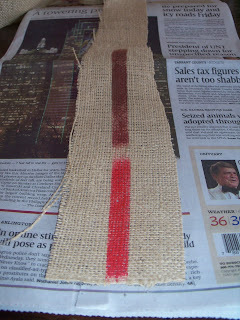 So, I cut a square of burlap a little bigger than my chair seats. Taped off the stripes. Painted the stripes red. I found out that you can paint them as perfectly or imperfectly as you like. The less perfect ones looked a bit more vintage and authentic. Here's what it looked like after I pulled off the tape. At this point, I'm getting a little excited about this. 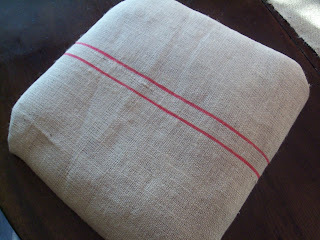 Here are my finished burlap fabrics for my two seats. They needed to sit a while to dry completely. Put the seats back on the chairs. Not bad, huh? Ten bucks! I put the chair back in it's place. Sorry for the mess, we're getting ready for Valentine's Day. I think they look really great, especially for ten bucks. Thanks, Kathleen for the idea and tutorial. Wow!! These turned out beautifully! 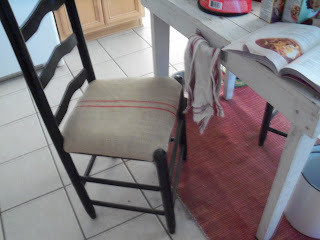 Now I want to re-cover my kitchen chairs too. I love them. Thank you so much for your kind email and for your mention of me on your blog. Thank you for the link too. I'm so glad you found me and that you liked the tutorial! As a result, I have now found a great blog and can't wait to go explore! Have a wonderful weekend. Good job on the cushions...they look great! Those look awesome and great idea!!! Tanks for linking up! I love it! I've been wanting some of those too. I can do this! Thanks for the tips! What a great idea and they look wonderful. I can't wait to try this. 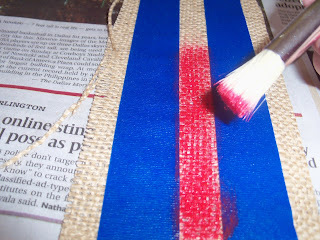 I'd like to give this a try -- did you use fabric paint? Or just regular craft paint. Reply: I used fabric paint. 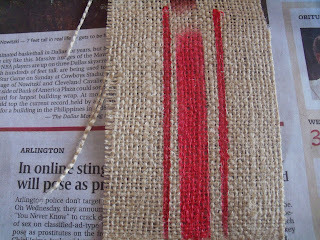 Kathleen@Musings from a French Cottage used a fabric marker but I couldn't find that. 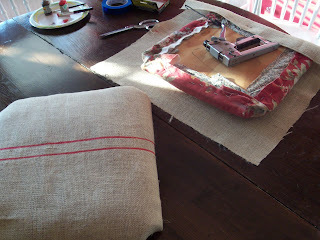 I am going to recover a bench using the same technique but I will use a canvas dropcloth as my fabric. I would love to see how yours turns out. I love your chair recover - what a fantastic idea. Sorry I'm so late adding a comment but I didn't see your post on my Google Reading List. I also wanted to let you know that in honour of the Winter Olympics being held here in Canada, I'm giving away a few little treats and wanted to let you know about it. The closing date is Sunday, February 21st. You did a great job. Fantastic! Let us tell you something Lady: YOU ARE GENIUS!!!! Very cool--and thanks for the tutorial! 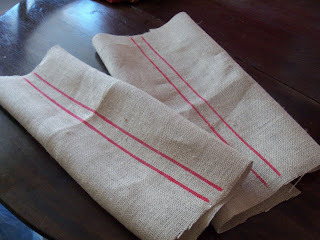 I've been wanting to DIY some grain sacks for a while now. They're so neat, but who wants to pay $40+ for them?! Not to mention this way you can also use any color you like in case your house isn't done in red or blue! What a great idea! My wheels are spinning...thanks for sharing! So very nice!! I love what you did with em!! This is fabulous. I can't wait to try this. 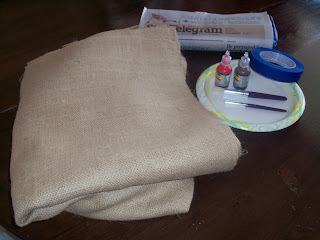 I may end up painting all my burlap!! 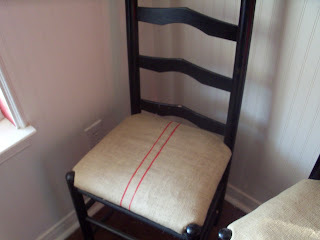 i did a similar grain sack fabric with a drop cloth and red stripe....i also used tape and a stencil brush...2 months on it still looks great...love how your chairs turned out..
Wow! That is an awesome idea. Thanks so much for the tip. What a difference $10 and some time can make. 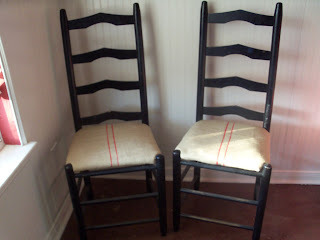 Love the chairs! Thank you so much for linking to The Virginia House! I love this idea and can't wait to use it! love this idea, looks very authentic! 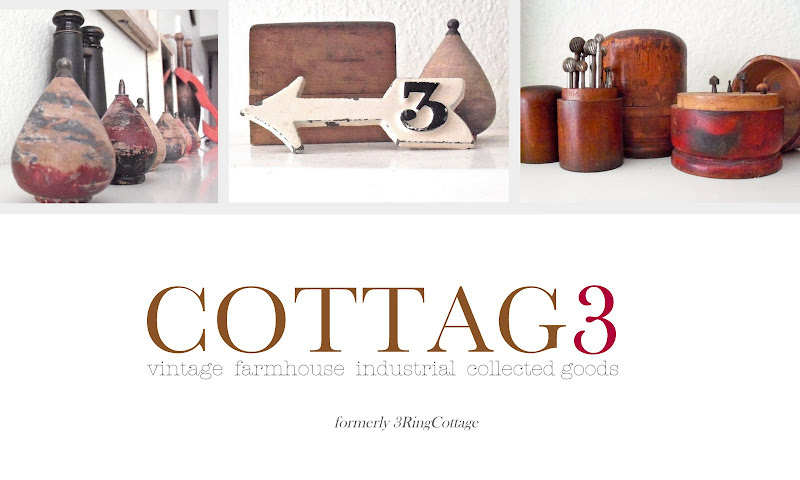 started to follow your blog and am inviting you to follow mine too!